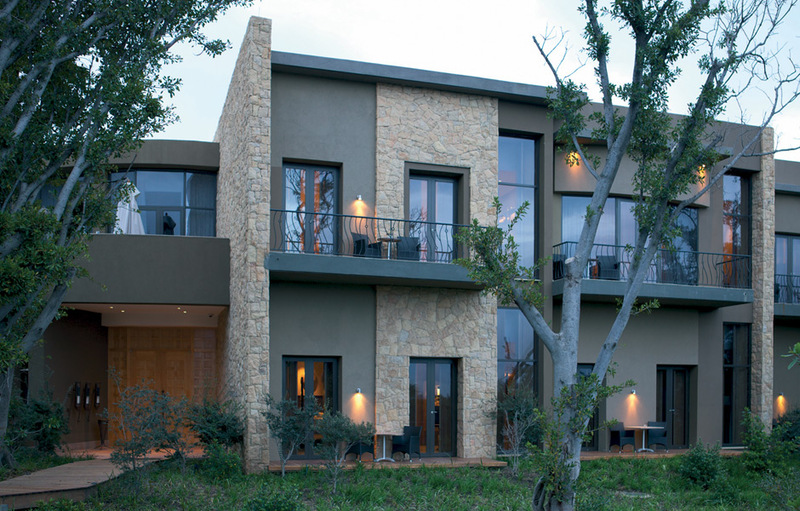 For those who do not compromise, the Saxon Boutique Hotel and Spa will tick every box. Situated in the exclusive suburb of Sandhurst in Sandton, Johannesburg, every inch of this stately five-star hotel is graciously and lavishly decorated in an elegant, understated African style. The Saxon has been voted the World’s Leading Boutique Hotel for the past six years and it’s easy to see why. The exquisite foyer with its sweeping staircase and shimmering chandelier are bathed in natural light from the glass domed ceiling. Here guests will find the hotel’s boutique shop, piano lounge, smoking library and the dining room. The connoisseur of the finer things in life will be impressed by the Saxon’s impressive collection of art and artefacts which are on view throughout the hotel. The peace and tranquillity of this six acre estate is enhanced by gorgeous landscaped gardens and an abundance of water features including the 920m2 swimming pool. The Saxon Restaurant is the ultimate fine dining experience. A plethora of world class chefs are on hand to ensure that each meal is a sensational masterpiece. Fresh fruits and seasonal berries are colourful eye candy at breakfast while lunch and dinner menus change with the seasons incorporating the freshest produce and African game meat and seafood delicacies. A variety of exceptional wines complement the sumptuous faire. 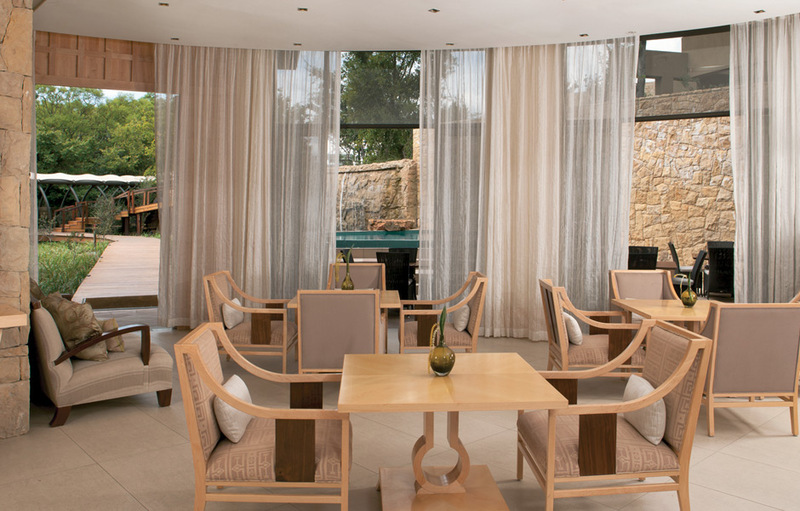 Visitors to the Saxon Spa & Studio will enjoy a soothing and holistic wellness experience. 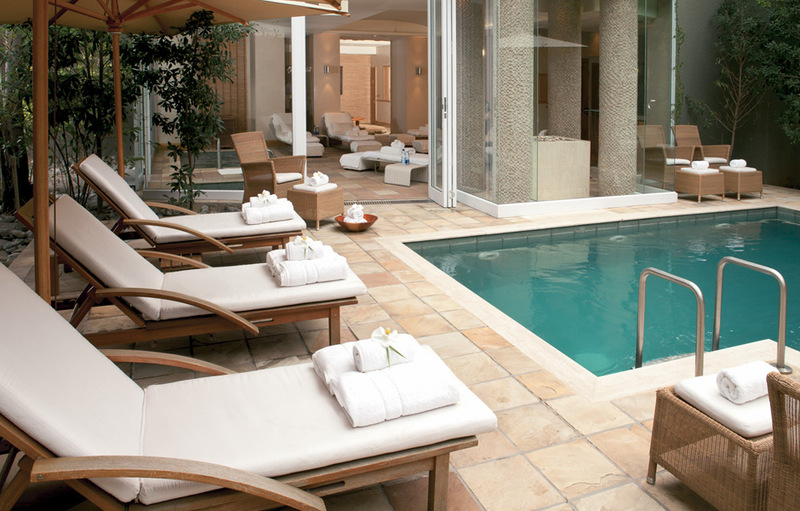 The onsite health centre has a fully supervised state-of-the-art gymnasium, a Clarins beauty salon and steam rooms. Continuing the Saxon’s soothing focus on water, the signature treatment at The Saxon Spa & Studio is Sound Therapy, a unique treatment where specialist therapists play the gongs and singing bowls to create the sounds while you relax on a water bed. A colour therapy unit enhances this magical treatment. The Hydro facilities include an exterior heated pool with sensational showers, interior heated jet pool, a cold plunge pool, flotation pool and a steam room. 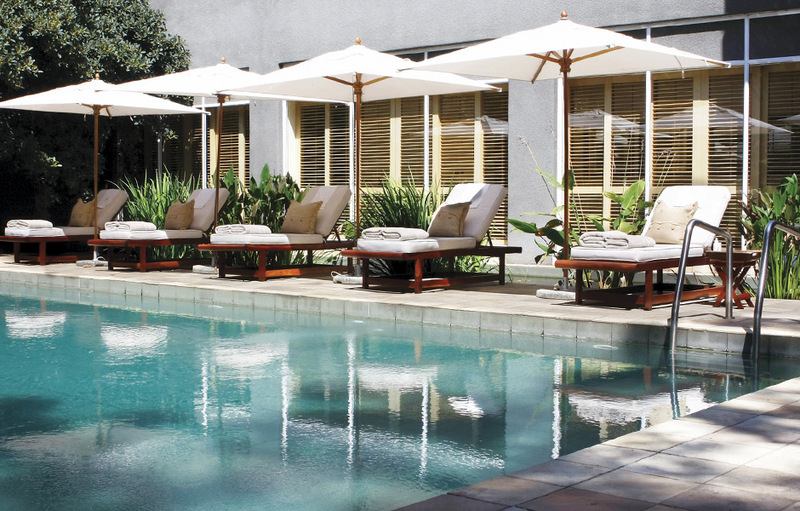 The Saxon Boutique Hotel and Spa has 26 suites overlooking the tranquil gardens or pool area. 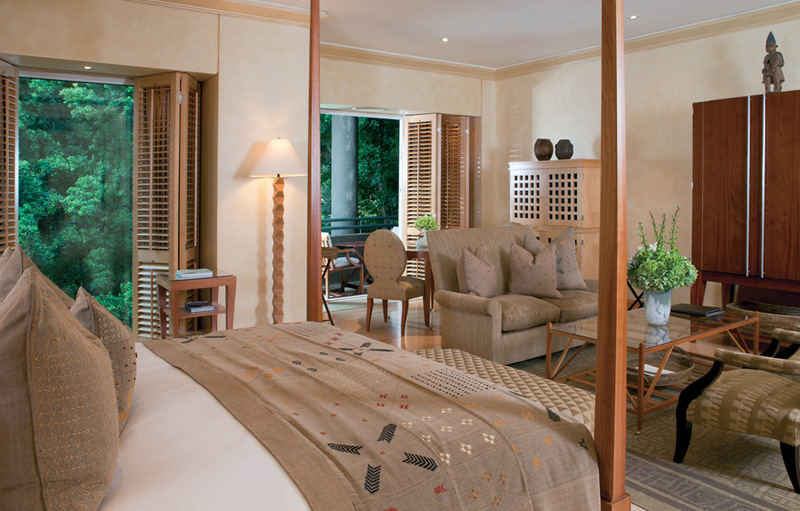 The hotel’s African elegance is carried through into each suite. All the comforts of home are at hand in the large screen televisions and DVD players and surround sound systems. There are workstations with multi telephone, fax and ISDN lines in each room. For additional comfort, the four Presidential Suites each have a separate lounge and dining area. 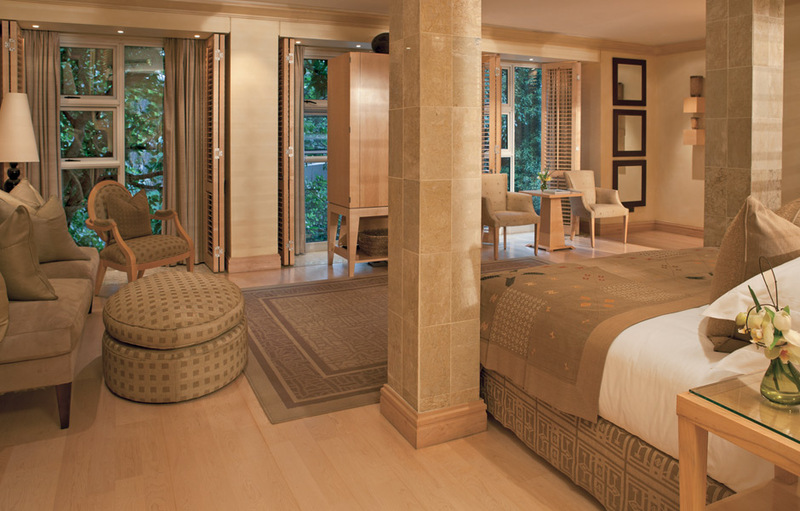 For the ultimate in luxury the Mandela Platinum Suite and the Mbeki Platinum Suites are an enormous 500m2 each and include two en-suite bedrooms, a butler’s kitchen with private elevator, separate lounge, dining room, Jacuzzi, steam room with walk-in shower and closet. The Villa Suites each have their own private terraces and plunge pools. Two Villas also have a private spa suite.